After the interesting heart rate readings from Brands Hatch, I once again wore my Fitbit for the races at Croft. Qualifying was my first ever lap of Croft, and with the rain absolutely clowning it down, you might expect me to be a bit excited about it all. So, much like I thought of my own performance in that session, it’s a bit ‘meh’. But then things dried out for the afternoon, and for my first ever dry lap of Croft I’d have to be at full racing speed with no idea what the car would do in the extremely fast corners. So we have a new record at 172 bpm peak! A lot of the back of the circuit is foot to the floor, and then just turn the sucker in and hop you’re on the right line. I like this sort of thing, but it’s unsurprising that it would get the old ticker beating a bit faster. There was also frustration at not getting 2nd gear, and Darren Lomas filling my mirrors waiting to pounce on any mistake. Race 2 saw the return of rain with a vengeance. I’d sworn to push, whatever the conditions, and couldn’t actually see much of the track, corners, or other cars because of the spray. And I was taking those same flat-out sections as fast as I dared in those horrendous conditions. So you’d expect, if my heart didn’t stop completely because of me being dead, or something, that my heart rate would be through the roof, right? OK, so this is the same pattern as Brands Hatch, but this time the high heart rate seems more linked to high speed than being inches and split seconds from disaster. In that second race I was enjoying myself and having fun, but I’m pretty sure I remember having a bit of a whoop inside my helmet in the dry race, too. Is it that I’m more used to the track and so much more relaxed for that second race? Because the pressure is off to get the car back safely for another race? 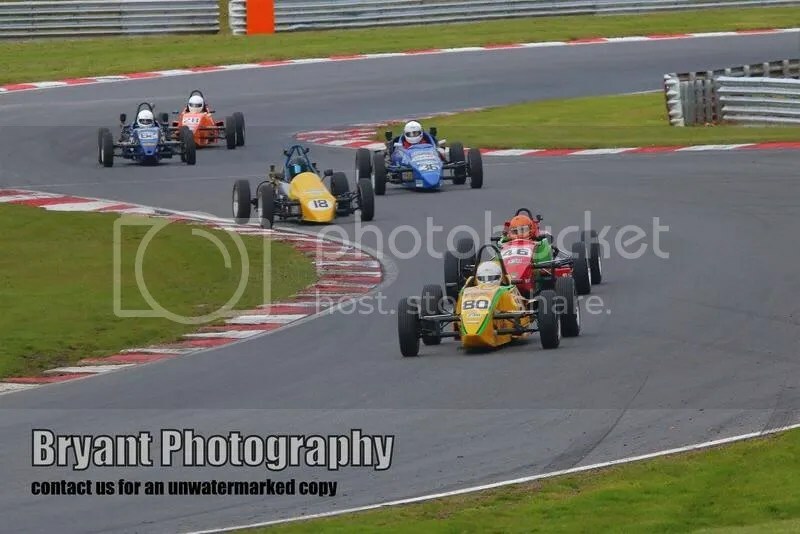 At Mallory Park the qualifying session and both races are all on the same day – so will this same pattern repeat, or will the hear rate get higher and higher like it has done on the first day of a race weekend? 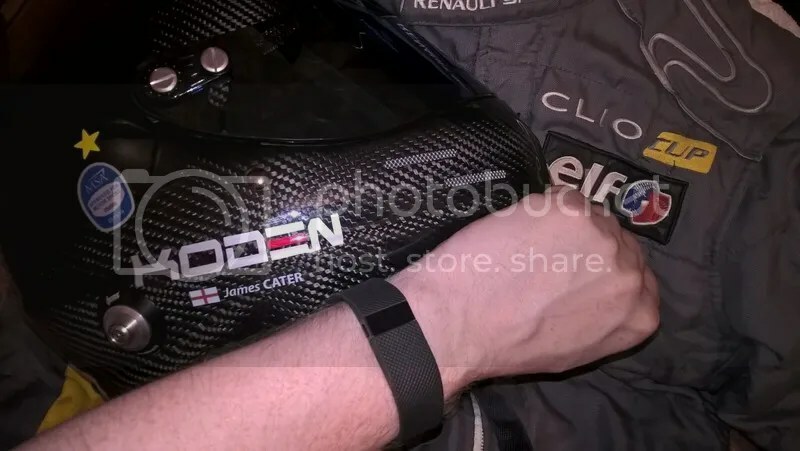 A FitBit in a racecar! It’s worth saying from the start that I am not the ‘fit bit’ in the racecar. For those who don’t know, a FitBit is a bracelet type thing that keeps track of things like heart rate, how many steps you’ve taken, how much sleep you’ve got, and any exercise you’ve done. There are a load of cheap ones on the market and the main thing missing is the heart rate monitor, but I chose he FitBit HR because it has this and works on Windows phones. For £100, they’re very clever pieces of kit that can be use to set and track a lot of health targets, even including calories burnt and helping with a diet plan. My main interest, though, was to find out what happens to my heart when I’m racing. For the Brands Hatch round of the 2016 Formula Vee championship, I wore my FitBit, and have taken several screenshots of the heart reading that I got from the weekend. My normal resting heart rate is around 66bpm. Based on age (220bpm minus your age), my maximum heart rate is 181bpm. 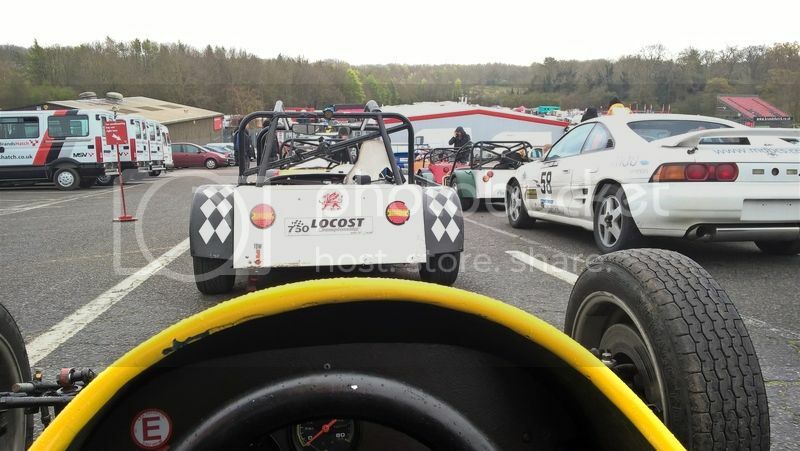 Arriving at the circuit on Friday afternoon, it seemed like a good idea to take the racecar to get scrutineered (officials check the car and your kit are safe and within the regulations) ready for the weekend. A ‘formula’ racecar is a bit of a beast. It has one sole purpose in life, and that is to go fast. Two – if you count “trying to kill you”. The point is that even being around one will get you going a bit. I jumped in the car and drove about 200m up the hill in 1st gear, just to save us pushing it – and then checking the heart rate logs my pulse went up to over 120bpm just doing this! I’d asked people on Facebook and at work what they thought my max bpm would be – and this showed that a few would be way off the mark! The following morning was where the fun really started, and I strapped into the full 6 point harness, donned my helmet and HANS device, and rolled out onto the circuit to complete the qualifying session. As you’ll see from the graph below, whizzing around a track got my heart pounding up to 152bpm! Perhaps unsurprisingly, this peak was early on in the session, where the fear and excitement are strong, and your brain readjusts to thraping a car around at over 100mph. What is something of a surprise, is that my heart rate dropped to almost 110bpm in the middle of the session as I settled into a rhythm and got used to things, before rising to around the 150bp mark again as I gave a push to find a decent lap time. Then came the first race of the weekend. 30 cars all trying to pile into the first rollercoaster of a corner on cold tyres is a thing to behold. Even getting to the grid and waiting for those red lights to come on is pretty stressful – your visor steams up, and your adrenaline is in overdrive. When the red lights switch off, and you try to get the power down faster than everyone around you, you’re already in that deep calm state. The only thing I can really compare it to is a fist fight. All the fear leading up to it lasts until you get that first punch in the face – then you’re just into the battle and you find everything slows down for you. You start to think and plan and the blinkered tunnel around you starts to open up again. As you can see, my heart rate was pretty high the whole time, but that 171 peak was undoubtedly when I lost the back end on the last lap around Surtees. To me, this was massive, and I felt the back come around, snapped on some opposite lock, and then found I was headed off the track at a very high speed. I thought it was an accident, and it would be a big one, but by luck or judgement I’d got the amount of correction on the steering wheel so exact that somehow still got it turned into the following corner. Of course, on video, this looks like nothing. Quick twitch, carry on, no drama. Anyway – that was the peak of the weekend. You can see slight patterns, but I don’t think the FitBit is sensitive enough that you’ll be able to see stuff like: 156bpm around Paddock Hill, 148 at Druids etc. I tried harder in race 2, without question. I also had a large can of Monster energy drink about an hour before I got in the Vee. Yes – that’s a peak of a mere 134! So much for energy drinks increasing your heart rate! I find this pattern very interesting. The initial peak is that start and then the lull is waiting on the grid after the race was red-flagged. You’ll not that on the restart, my heart rate rises, but is even lower overall, and with a big dip. The spike will have been from a battle, and then the dip from when I was ‘in the zone’ chasing after another driver. The peak will be me catching him and pushing hard to do so. And so what does it all mean? I do concentrate hard on my heart rate in the gym – how to control it and lower it. It seems this kind of training is well-founded! The 171bpm peak isn’t entirely unexpected, as we’re all doing something pretty stupid out there – and trying hard to do it, too! We’re also experiencing life like few others ever do. Because of that I’m wondering if this pattern will be the same at every race? I suspect the lower heart rate in the second race is a lot to do with the body and mind getting used to being exposed to extremes. It’s more used to it, and copes better each time you do it. There’s less fear, less excitement, and less stress. It’s like building up a tolerance to eating hot chilli’s – what you used to think was unbearably hot is now a mere tingle on your tongue. One thing is for sure – time spent on aerobic exercise is time well spent for a racing driver! I’ll be hoping to use my FitBit at all the races, and will post screenshots for those in the future. Until then – don’t forget to breathe!